But it's not just great for helping to close sales, it's also a great way to continue to build your relationship with customers by continuing to be helpful. If you have effective nurturing campaigns in place, you may be able to upsell or cross sell in the future while keeping churn rates down. After all it costs a lot less to keep an existing customer than to acquire a new one. Before I do anything, I make sure I have a clear goal written down, and more often than not a SMART goal. Without a goal, how will you know what you’re trying to achieve and how will you measure success? So ask yourself… Why am I sending this email? What do I want to get out of it? What does success look like? So, before you start set yourself a clear, actionable and quantifiable end goal. Download our FREE SMART Marketing Goals Template to help you determine your overall marketing goals. Your not just B2B - you also need to be H2H. People don’t do business with companies, they do business with people. So make sure any emails you send are from actual people in your organisation and not from addresses such as marketing@companyname.com. Include a well designed email signature which includes a friendly photo so that recipients can put a face to the email address in case they haven't met you. They’re much more likely to remember you when you call! If you want to make a connection with a potential buyer, sending content that is relevant and personalised will significantly increase your chances of success as its proven to increase click through rates. Secondly, you need to provide content that is helpful, valuable and suitable for whatever stage of the buyers journey they are at. Again, you can use data in your CRM to drive this along with automated email workflows based on particular criteria. On average, personalised emails improve click through rates by 14% and conversion rates by 10%. Start by remembering that you are competing with a lot of other peoples emails in inboxes to get yours read. So make sure your subject line stands out, but don't make it misleading just to try and get someone to open it. DON'T use spammy words like "Save..."
For some great tips on subject lines check out HubSpots blog post on the topic here which goes through 10 ways to make your subject line really stand out. Another great source of inspiration is OptinMonster's list of subject lines which you can find here. Take a look at some emails you've received that immediately grabbed your attention and resulted in you opening them straight away, along with those that compelled you to take an action like downloading an eBook, registering for an event, booking a consultation etc. Use these for inspiration for your campaigns. Your email preview text is like the meta data on your web pages. Great meta data helps grab a searchers attention so that they click on the page link. The same applies to email preview text. Your preview text should give a brief description of what your email is about. People will scan it and ask themselves if it looks like something of value to them, is it worth reading on? Make sure you keep your preview text to about 50 characters or less. If you don't it, will get cut off. If your subject line and preview text don’t grab the recipients attention straight away, then that email may never be opened. Your goal when writing these is to encourage the person to open the email straight away. Use your goal to optimise for engagement. You want people to read your email and take some action as a result. People are busy so be brief, clear and compelling. If you are including images make sure to add alt-text and link them to an offer. Encourage sharing by including social media and email sharing options. There is a lot of discussion and opinions around this, but the best way to know what the right time is, is to use the analytic's you gather over time. Use them to figure out the best times. Tuesday: The best day to send emails according to the majority of the data from these studies. Thursday: Choose Thursday for your second day when you send 2 emails in on week. 8 p.m.-midnight: It looks like emails generally receive more opens and clicks later in the evening. This may be due to people checking their email before going to bed. 2 p.m.: It looks like people are looking for distractions to work at this time so it may be a good time to try. 6 a.m.: Lots of people appear to check their email before getting out of bed! Another benefit of 6am is it may be at the top of peoples inbox when they arrive at work or are commuting. Secondly, knowing when to send an email. For example, if someone downloads an offer when is the best time for a follow up mail e.g. the same day? 1 day later? etc and how do you best time a lead nurturing email sequence - how many days should be in between each email? Delivery rates - Are your emails actually getting delivered? Click through rates - Are people interested in the content of your email and what you have to offer? What are the most popular links? 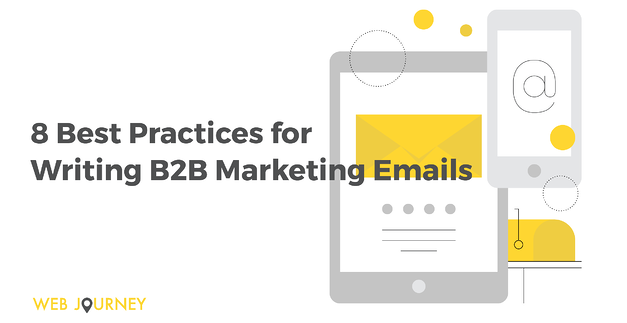 Improve your emails by learning from results and using your results to help tweak emails and to A/B test future emails to see what works best for your audience over time. Good email campaigns should speak to your buyers at each stage of the buyers journey providing them with useful content tailored to whatever stage they are at. Email marketing is still one of the most cost effective ways of growing your business and if you follow best practices and plan your campaigns and content well, you should see a good return on your investment. Above all, send the right email, to the right person at the right time. If you would like to discuss these best practices or need any advice on your email marketing, feel free to contact me at sinead@webjourney.ie.